Ratings are averaged based on 145 reviews. Could not fault our stay at Intercontinental Fiji. From our gorgeous spacious Club Room with amazing views to being treat like royalty in the Club Lounge, with complimentary high tea and evening Cocktails and canapés every day! Pools and grounds were immaculate and friendly staff that always made us feel welcome. Beach and surrounds were like a postcard. We will be back! Fantastic resort, plenty to do, or relax. Staff super friendly and helpful. Service excellent. Love choice of pools, restaurants, plenty to satisfy all ages and stages.???? We had a great time there last week. The views are amazing. We had all our entertainment and activities in and around the resort, didn't need to drive out to look for things to do. Room is very comfy and spacious, but the cleanliness in details can be improved. Staff are very warm and friendly. The meal is a bit pricy, but considering the view and convenience onsite, it is acceptable. My husband and I also booked for a 3 day open water diver course with the reef safari at intercontinental. The dive instructor Emma and Jamie are great. We had an awesome time getting confident with the skills and equipment and exploring the underwater world. We also tried the intimate cabana dinning. It is an romantic experience overlooking the sunset scene at navo, even though we both had a few mosquito bites. Look forward to coming back in future. The best resort we have stayed at in Fiji. Location was beautiful, food was great, we would not hesitate to return. We recently stayed at the intercontinental in Fiji. The resort is amazing beautiful views and great layout. Our room was very spacious, the only downfall that it was very noisy being right next to the adult pool. Overall we loved the resort and it's location. The people are very friendly and polite. And I would definitely go there again. Everything at this resort was excellent. Service was great and you could do as little or as much as you liked. Not the resort's fault, they were very helpful. Loved the Fijian people who were always super-friendly and helpful. We are hoping to return next year! PERFECT! We enjoyed daily morning walks on the clean sandy beach that was covered with postcard palms. We would watch the locals go about their business with horse rides, selling coconuts and massages. We found them friendly and honestly to be a cultural asset to the hotel by making it a real Island experience. We dined on a range of western to Fijian meals that were not only tasty but most importantly suited for all our dietary requirements. I loved the daily plunge in both the family and infinity pool but nothing can beat the beach and the water activities the hotel offered such as kayaking, snorkeling etc. The staff at Intercontinental always had a smile on their face and were quick to make your day with BULA! I cannot wait to come back to Fiji and most importantly Intercontinental because they made it MY perfect place. This hotel was busy with functions during our stay. We were offered a room in a quiet area up the hill with beautiful views from the balcony. We were grateful for the adult only pool areas and eating options. My spa visit was heavenly and golf was fantastic. All entertainment was exceptional and the village choir on Sunday was uplifting. I would not hesitate to return in a flash. We highly recommend this resort. It is a dreamlike location. We never left the resort as there was something we could do every day. We will definitely be back!!!! This is a beautifully managed property with so many wonderful aspects - the high quality rooms, manicured gardens, friendly and super helpful staff, great food, beautiful beach and so much more. A true 5 star experience in a slice of Fiji heaven! We stayed here for our honeymoon and had a fantastic time. They upgraded our room for our honeymoon and the Fijian people are so helpful and friendly. The resort is about an hour away from Port Denarau/Nadi if you wanted to go on excursions which we only did one day as we preferred to spend our time relaxing by the pool or using the facilities on site. The water is beautifully clear for snorkelling but there isn't a lot to see. Overall we would highly recommend staying here! Intercontinental is an amazing hotel with friendly staff & amazing with kids! Service is impeccable & rooms are brilliant access to pool & beach are very easy! Will visit again! We have had 6 nights of absolute heaven, really the Intercontinental doesn't put a foot wrong. Yes, the food is not cheap - but it is very well prepared, and generous in its servings. The best choice for us by far to was to upgrade to Club level. The extras like high tea and happy hour, the club rooms and facilities were worth every last cent of the upgrade, and the club staff make a fantastic place even more special. Staff, food, facilities were amazing. Kids club brilliant. Spa lovely, Beach paradise. Best of all prices matched Nadi Town and Port Denaru..there is no need to leave the hotel it has it all. Cultural shows fabulous! Thanks for having us! This is our second time staying at the InterContinental. The staff are incredible. They are always happy and friendly and nothing is ever a problem. They love children and are amazing with them. We will absolutely be returning again next year! This is a great family destination and a good option for families wanting to stay on the mainland. The staff are wonderful, helpful, friendly and amazing with kids. Only downside are the food options aren't great and high prices given what you get. Lovely well maintained resort, staff were really nice. A bit on the expensive side for food and drinks. But overall a great stay. Facilities, location & cleanliness was great. Beverage service very slow. Food & beverages are expensive so definitely worth getting the scrumptious all you can eat buffets breakfast included. Make use of the fresh fruit kept on ice around pool area. Strongly recommend stopping at supermarket to grab nibbles and water. Very luxurious stay. Outdoor bath is amazing. Positives first best location on the mainland staff were excellent great for couples and families. Advise to take your own a adventure out to the local markets. We've been to Fiji about 8 times and this time was the best trip so far we feel. We've visited as a couple, then with 1 child and now with 2 and I think Fiji InterContinental caters for all no matter whether you're going on your own or with family. The combination of the outstanding resort facilities and the pristine whites sandy beach out the front means there is always something to do. Even though it rained for the majority of the time we were there (along with some flooding around Fiji) we agreed there would have been no better place to be. The hotel staff were outstanding and we felt the food was some of the best we've had. We'll definitely be returning there next year and may make it our go to resort going forward. A very relaxing and enjoyable holiday.loved the infinity pool and the staff. In addition to couples I would recommend the resort for families with small children. Meals at Navo were excellent. Beautiful resort ! Exceptional Service ! We chose the Intercontinental mainly because of the great deal offered by Travelonline. Generally we prefer smaller boutique resorts but we were pleasantly surprised staying at this large 5 star resort. The resort is beautiful in all aspects. The rooms are spacious , the dining areas are very elegant and well designed, the gardens are beautiful and well maintained. Dining at Navo and Sansara for breakfast was fantastic. The location is quite isolated and the beach was dissapointing because there are lots of seaweed and rocks in the sea. We had a fantastic time as we celebrated my Birthday and the staff provided a wonderful lunch and cake for me and a bottle of wine and chocolates. All the staff knew it was my Birthday and made me feel very special. The staff made our stay wonderful. I recommend this resort to both couples and families for a relaxing getaway.One thing to note the food and drinks and playing Golf is very expensive . Hi there the Resort is fantastic. Dining experience in Toba Bar and Grill probably better than Sanasana except that breakfast was awesome in Sanasana. Pricey place but beautiful none the less. Awesome staff very empathetic to your needs. Resort staff were great friendly and accommodating specially with the kids. We had a lovely time and would definitely recommend. I was travelling with my teenage daughter and it was very easy for us - we felt safe and relaxed. The staff were outstanding, nice rooms & very clean. Overall thoroughly enjoyed ourselves. We made a couple of day trips from the resort, booking and transfers were made easily. My husband and 10 month old son stayed at the intercontinental Fiji for 6 days. We were greeted, showered with love for my son and upgraded from a garden view room to a beach view. The room was stunning!! The food, cocktails and staff were sensational. I would highly recommend this resort for families as the staff just love children. The highlight for us was the beautiful friendly staff, they are so obliging , accomodating , anything is possible , they are always happy, smiling, friendly..
Our stay was highlighted by the fact that the beautiful staff are so friendly, and will do anything to make your stay as comfortable as possible,there is nothing that is s problem . I expected to the enjoy the trip and come home refreshed. I was pleasantly surprised when the Intercontinental Fiji surpassed all expectations - in every regard! We had an amazing time in Fiji, thanks to all the great people at the Intercontinental that made it so much fun. Great room and the Club Intercontinental is the best. Will be coming back soon. After 10 years of taking my son to Fiji (from age 2), I can't believe it took this long to stay there! We had previously visited Natadola Beach and had lunch at Tobu but not actually stayed at the Intercontinental Golf and Spa resort. The service, food, hospitality was amazing! We spent a lot of time at the beach being active- snorkelling, surfing, swimming etc. the rooms are very large and the outdoor terrace brings in the outdoor/indoor living. If there are any issues, it's the way the management and staff rectify the situation and sort it out. That's the difference for me. Sometimes things happen so it's all about a positive outcome. That's is what this resort does. I'm going back over the Easter break and taking my sister. Our recent stay at the intercontinental fiji , in January was above expectations . The lounge facility was fantastic for us and the kids . The resort was immaculate , the staff warm and efficient . I would definately return to this resort . The Intercontinental was absolutely perfect for our family. the location is amazing and there is so much to do. the resort is beautiful, the room was really spacious and the kids club rocked. the service was second to none too. snorkelling on the reef a few minutes away by boat was a highlight. We were upgraded to their Club rooms which meant we had additional services such as a High Tea at 3:00pm every afternoon. Restaurant prices were a little expensive. The staff were absolutely fabulous - nothing was too much trouble. This resort was beyond my expectations and more. The facilities were incredible and the staff were lovely. I am certainly coming back. We had the best anniversary trip! Intercontinental is a beautiful resort on a beautiful beach with great little reefs to snorkel. The people working at the resort and so friendly and helpful. Things are expensive but we expected that. We were able to save by getting the breakfast buffet package and then just sharing some nachos by the pool at lunch and we brought some alcohol. We definitely plan on coming back and bringing the kids. Lovely room +well maintained resort. Great location. .Food from OK to great like all Fiji Resorts. Lack of happy smiling people compared to other places (especially the guests). I took my two adult teenagers for a week and we thoroughly enjoyed the beautifully appointed and designed room. Very luxurious, fantastic modern architecture, very comfortable. We would have enjoyed a little more if the un motorised sports were free and that there was a little more provided for by way of activities eg tennis or other sport for active teenagers. Absolutely amazing property. Breath taking views would recommend for couples or families. I went with a friend which was good but more of a relaxing resort where we wanted to see the culture and do activities. The biggest selling point for me was the beach and crystal clear waters - such a great change from some of the closer resorts to Nadi. A little bit pricey as every activity incurred additional charges but well worth it. We very much enjoyed our stay the the Intercontinental Fiji Resort & Spa. Lovely and welcoming staff. We travelled with our 16 month old baby and she loved the toddler pool, whilst my husband and I enjoyed the beautiful views at the beach. It was paradise and we will be back in the future for more! Resort is HUGE! Buggies or the bula bus will take you around. Would recommend requesting a room near the all amenities although, if you are near the pool it may get a little noisy. Food is on the pricey side but the food was quite reasonable - not bad. 4 restuarants in total (2 adults only & 2 kid-friendly). Would definitely recommend the buffet breakfast at Sanasana - loved the unlimited juices (I'm going to miss that for sure!). The people and service is incredible, this was my 3rd time to Fiji it never fails to amaze me how happy and friendly the people are. A lot of people mention the cost of food/booze, and whilst yes it's does seem more expensive (than say an Asian holiday escape), with the Australian dollar being so good it is very much on par for any Australian/NZ hotel. Whilst this resort is huge, it is very spread out and family orientated but also great as there is an amazing adults only, ocean facing infinity pool and Navo restaurant is generally child free, yay! (No offensive to kids + there is a giant family pool & Trekkers kids club). There are 4 restaurants from fine dining (Navo) to buffet (Sansana) to lounge-y (Karma) and the grill (Tabo). All have good food depending on what your after, but do yourself a favour and try the lobster Kokoda at Navo. The last piece of advice is get a cabana spa massage! Beach front and totally worth the money. I had 60min Fiji massage on day 2 and 90min Oceanic body massage on day 5! The ladies are amazing! This place is paradise, the beach is beautiful, the rooms are amazing, the staff are so friendly..
A little pricey for food and drinks but fine if you allow this in your budget. Great kids club and the best spa. Will be going back again for sure. We absolutely loved staying here. The staff are amazing, the location is superb and the food was exceptional. The only issue we had was that it is very expensive. But overall we would love to go back and stay again. It was my husband's and my first time to Fiji and intercon Fiji. The resort was very beautiful as was the amazing room we were up graded to. We were up at the club lounge that allowed us to have free cocktails and canopies between 5.30- 7.30. Our mini bar was all complimentary and was stocked every day. Our room had a plunge pool and we over looked all of the resort, our rooms were cleaned everyday and let's not forget our turn down service every night!it was amazing!The staff couldn't do enough for us everyday. There is also a good variety of food to eat at the few different restaurants through out the resort. Our overall experience was just magical! Would recommend this very breautful resort. The intercon was great for an easy resort stay. The food was fresh but limited dining options. Long,long waits for service so order early with kids. Kids club was great but has set session times which was a little tricky as we didn't really want our kids away from us for four hours at a time missing dinner with us. The grounds are lovely. The beach is beautiful. Staff friendly and rooms are clean and tidy. Had a great holiday. The location was beautiful - lovely beach and gardens. Room was nice and we were upgraded to superior room on arrival. It had a lovely adult's only pool which was good for us as a couple and also a very large pool for families. Food was ok but was hard to get a snack for lunch as would have to sit down in restaurant and have a meal. Also location isolated so cannot bring in food so have to eat a restaurants for all meals. Food was exceptional at Navo restaurant. Golf course is amazing and best resort course I have ever played - brilliant design and scenery made for great experience. Overall magical holiday. Large modern property with full amenities. Wouldn't rate it as very 'traditional' in style. Food and beverages priced very much at upper end of scale. Quality and portions are good though. Service from staff generally good. Highlight is definitely location. Beach and surrounding waterways are top rate. Beautiful place to stay would definitely recommend others to stay. This is our second visit to the resort - Service wasn't as good as the first time we visited. Servicing of rooms was often late - attention to detail lacked: eg: cups that were used in our rooms weren't changed/cleaned/replaced. The whole holiday was awesome. The resort & staff were outstanding. Would recommend. Very modern resort being only 6 years old, rooms are fantastic (stayed in pool view room). The food and the service were excellent, several restaurants to choose from, and all of them fantastic. The golf course is a real challenge, especially when windy, it is a little expensive, but well worth it if you are a golfer. Had a very relaxing and good time, did not have to worry about anything, service was good and all staff was very friendly will definitely go again. Loved everything about our stay at this resort. We are already thinking about booking our next stay for our family! A beautiful 5 Star resort with a wonderful Fijian feel, the staff are fantastic, very friendly, helpful and happy. Food was great, we loved the breakfast buffet - some amazing pastry chefs work here! Try the cassava cake, it's delicious. Gardens and scenery stunning. Family pool perfect, generous with pool towels. The beach is lovely and calm water perfect for kids at one end near the island, some waves further around if you want them. Lots of activities and excursions available if you want, or relax in the beautiful pools, on the beach or in the cabanas. Great entertainment at the Kama lounge. Amazing holiday. We had a 10/10 trip. We loved the staff, they were super friendly. Felt very welcome and the best thing is we didn't have to leave the resort because there was so much to do. 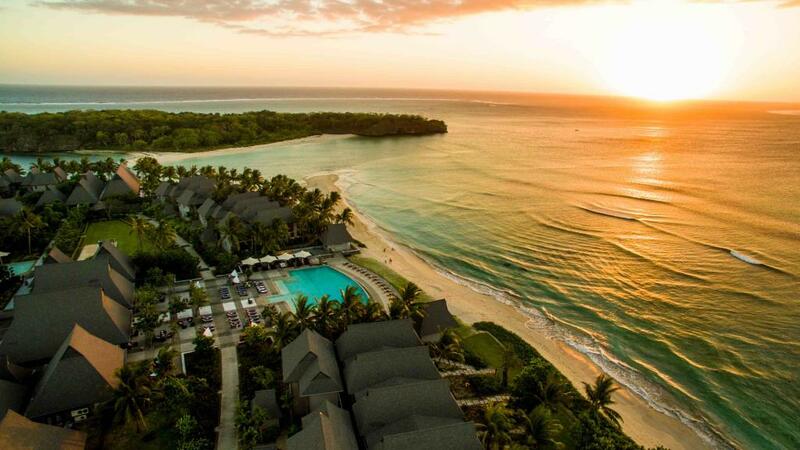 I recommend fiji and Intercontintal Hotel for families and couples. Pleasant staff & friendly service. 1) Customer service has improved a lot comparing to our last stay two years ago. 2) The NYE dinner was delicious, however the music / band was quite loud so it was hard to carry conversation at dinner. 3) we noticed the rooms look a bit tired comparing to our last stay two years ago. We were advised by staff that a renovation will take place to all the rooms in the near future. So we cant wait to 'enjoy' them when we come back next time. Overall, a pleasant stay despite of some wet days. I could not have hoped for anything better, and my daughters also loved everything about it! Absolutely stunning beach and crystal clear waters. The weather was windy for our stay which stopped the snorkelling we were hoping for. Nice long beach walks, fine dining restaurant very nice. Friendly staff. Staff were outstanding ,very attentive too all our whims they could not help you enough. Great rooms! Happy staff and helpful. Great snorkelling and pools. It was our second visit to the Intercontinental Fiji and it was as enjoyable as the first! The accommodation and service was fantastic. A classy resort with facilities to suit everyone. Staff are friendly and helpful, rooms are well appointed and the golf course is superb. First trip overseas, it really was layback and very enjoyable, we had a great time. Grandaughters wedding was simple and beautiful. Fijian entertainment was very exciting and we were all included.great night, great place lovely people. We had an amazing time , lovely staff ,fantastic breakfast,just great. Grandaughter's wedding was beautifully simple and elegant. It was a real pleasure for us. We have never been overseas before so it was a wonderful experience. We chose the Intercontinental Fiji Gold Resort and Spa as we have a 9 month old daughter and wanted somewhere child friendly but still a bit luxurious for us to enjoy before she gets older and we need a super family focused resort - this was definitely the right choice! The resort is stunning as is the beach, service is wonderful and the rooms are big and spacious. There is lots to do for kids, however probably not as much as other well known family resorts which focus ok kids activities like The Outrigger or Plantation Island. Our only gripes were that the pools are quite cold (we overheard this numerous times from other guests) which probably isn't an issue in the hotter months and trust me you want to swim in the ocean more it's so beautiful there, and that there isn't a lot of dining choices - the 3 hotel restaurants have very similar menus. That said, the food at each was top notch so we enjoyed trying something new each time. There are two other resorts close by you can eat at however we stuck to our resort for ease with a baby. Overall we loved it and are definitely planning to go back! Nice Clean and well run resort. The one thing I would like to see improved is not having to give the Bar or dining spots our IHG dinning rewards number every time we ordered something, this number should already be assigned to our room and the discount on the food and drink already calculated. I have a young family and it was great. We had a fantastic holiday and the staff at the hotel went out of there way to make us feel welcome and there attention to detail was first class. Great place for the family, or anyone for that matter. We had a few problems with the room, but my recommendation is to bring it up with staff rather than let it linger - they will attend to it straight away. lovely break away in the middle of winter. Organisation was excellent... no dramas at all. Intercon is located on a beautiful part of the coral coast within a 50 min drive from the airport, resort was beautiful with great facilities and a great selection of dining from family friendly to adult only restaurants. The staff were the most friendly people I have ever met and all requests were met with a beautiful smile. Would recommend to anyone for all types of holidays. Weather generally good in mid May & hotel staff were very accommodating, I would highly recommend this venue but not for the budget conscious. Great place for couples and families. Navo restaurant is amazing and so is the spa. Don't be in a hurry for food or drinks as they work on Fiji time! Rooms are clean and spacious. Excellent thats all i can say. Loved the place, rooms and view were amazing just a little expensive for the food. The interconnecting rooms for families are fantastic. My girls aged 7, 4 and 2 had a great time at Planet Trekkers (kids club) with the activities they had scheduled. The main restaurant during school holidays has a kids section in the buffet which makes feeding fussy kids a lot easier. The Fijian people are always extremely friendly and hospitable. We have stayed at intercontinental Natadola & always think of it as one of our favourite places. We were particularly pleased with our room upgrade & the wonderful friendly staff. We hope to be back next year & our daughter is also looking to book in soon. Loved the place and the people. We would stay there again. Amazing holiday. We had a very relaxing break with a wonderful view' great facilities, good service, good food. I would definitely recommend this resort. We ended up upgrading to the club resort which was fantastic. The staff are beyond amazing and go out of their way for you. The resort is clean with great facilities. I recommended some more menu options, but the food was great too. There are a lot of adult only areas, so I would rate this as more of a couples resort even though there are facilities for families. The Fijians are lovely people. The resort is very well maintained and luxurious. It is isolated so you really have to always eat at the resort. If you are a golfer you would have a great holiday. Not many people playing. Eating and especially drinking is quite expensive. Our family had our 1st Fiji experience at the Intercontinental and it was an experience to treasure. Stunning Resort in a beautiful Location! The Resort is fantastic and the Fijian staff as always were welcoming and couldnt do enough to help. The seperate kids and adults pools are perfect. All the food and varities were really good. Kids loved kids club. The beach and snorkelling were amazing...highlight to our trip! Loved it .... our new favourite spot in fiji...cant wait to come back! Our honeymoon was perfect. This resort is so modern and beautiful. It is situated perfectly next to the gorgeous beach along the coral coast. The rooms are great, modern, clean and roomy. The staff are wonderful, very friendly and helpful. We will definitely go back to this resort. We had a wonderful stay at the intercontinental, the resort and the facilities were great and the Fijian people very friendly. Would definately go back. It is great for ocean swimming at all tides and has a beautiful walking and swimming beach. Accommodation caters for all needs from private to pool side. It has a magnificent, beautifully kept golf course. All sorts of good. New private area for breakfast a great innovation. For families the beach hire equipment (kayaks, surfboards and body boards) is too expensive and this should be corrected. As a result it is not used much. We really enjoyed our second stay at this beautiful resort, this time with our children. The staff are very friendly and helpful, and the facilities are fantastic. We also were very pleased with the help and care we received when my husband became ill during our stay. We hope to return again. We spent six nights at this resort and enjoyed our time very much. The rooms are well appointed and the food was plentiful with great variety. The resort facilities are excellent and the service, while slow at times, was always courteous and helpful. I would highly recommend this resort to families looking to enjoy a relaxing holiday on the Coral Coast. Impeccable service and food. Beautiful resort for families (like us) or couples. Would highly recommend to anyone. We were amazed by the place from the very first moment we arrived. The free upgrade from pool view to beach view was a real bonus and won us over instantly. The staff were friendly and the environment very family orientated. The only negative thing I would have to say about the Intercontinental is that just about everything is chargeable. There needs to be more transparency on this matter. Other than that we had a great time and will definitely be returning. An enjoyable stay in a beautiful location. A truly beautiful resort which is situated on the magnificent Natadola Beach. Prices for food and drink were quite high. Wine was definitely not affordable. The place has a certain ambience and all the facilities are clean and maintained to a high level. The staff were friendly but the service was sometimes slow or non-existent. Our room was very nice with a comfortable bed and pillows. We stayed for 5 nights and it was very enjoyable. Great place people food drink facilities couldn't fault a thing, except for locals on beach that try and offer cheaper services, they can be a little annoying! Wonderful location and facilities and staff. All of which made our holiday perfect. Very modern and new resort with great facilities and friendly staff. The beach is beautiful from afar, but the sand has pebbles and coral, so not as pristine as described. The family pool is great and my daughters aged 3 and 1 loved the pool. We had the most wonderful time at this hotel- the best I've ever stayed at. We had great and friendly service and the facilities were top notch! A little piece of Heaven!!!! This is the second time we have stayed at the InterContinental and we will certainly come back again.!!!! This is our second time to the hotel. We love it because it's easy for families, the staff are always friendly and the location is beautiful. One tip, if you have a toddler, have dinner at Toba at least once; it's less hectic and has a great view. we had a wonderful time and would go again and to the same resort. Overall it is an amazing resort. Everything from the rooms, soaps & amenities in room, food, staff friendliness, the beach is incredible, the day spa was unbelievable & the property itself is beautiful. My only hesitation is that although it is fantastic for families with young children, it doesn't cater very well for children from the ages of 7 up as it has a kids pool which isn't too deep & an adults pool. Nothing inbetween. We stayed in the Beachfront Suite which was wonderful. Worth the extra money. The Family pool was large and shallow enough for my young kids to stand and play in. The kids loved playing by the beach as well. The restaurants were good. We dined at Navo on our last night, and the food/service was top class. We would go again, we would tell everyone to go. Its amazing! The beach is a beautiful white sand beach, sometimes with small waves so surfing is possible and with decent off beach snorkelling. Resort itself is beautiful - the adults only infinity pool overlooking the beach is amazing (no chlorine!). Staff very friendly and provided good service - no slow "Fiji time" with orders etc. Food was good by fiji standards, especially the breakfast buffet and the Fijian curries etc were good. Prices are all what you'd expect to pay in Aus, except the activities which are a bit cheaper. A very easy place to relax, we loved it. Everything we wanted from our holiday and I am ready to book again for next year. We loved this resort. Our Nanny was fantastic. The club extras is fantastic. Navo is amazing, both sanasaa & toba wrre good no complaints. We had a fantastic time, highly recommended. We felt food could be better otherwise great! Overall layout inside out is fascinating.We enjoyed the adult pool as well as the ocean.Room design and service meets a highest standard . Although the food and drinks are a little expensive we enjoyed every minute of our stay. My husband & I stayed for a week. The resort caters for families, individuals and couples. Families have a separate pool and pool area. There is an adult only pool where you can sunbake, swim and drink cocktails without being disturbed by children splashing and running (even though I love children). You can do as many water activities such as kayaking, surfing, scuba diving etc. or just lay in the sun. Staff are efficient, friendly and helpful. Food is a little pricey but all is fresh and delicious. We thoroughly enjoyed this resort and will be returning and recommending to friends and families. The location on the beach was just beautiful with actual water you could swim. We received a room upgrade to a beachfront which was fantastic. The staff were so attentive and friendly. Highly recommended. The most outstanding part of our holiday was how incredibly genuine and lovely the Fijian people are. The hotel staff were fantastic and the locals were also very nice, always willing to help. We were even invited to dinner in a local village at the home of a staff member to meet their family. For us Fiji was an amazing experience and we will never forget the beautiful smiles of nearly everyone we encountered. Resort more for couples than families. We are a family of 4 with 2 toddlers and had an amazing 5 days at the Intercontinental Fiji. We were well looked after. Warm, pleasant service throughout and a comfortable stay. Pristine beach, decent family pool and mostly decent food at the pool side Toba restaurant and the buffets at Sansana meant a good time was had by all. Excellent service like no other! The best, friendliest staff I have ever encountered in all my years traveling. Lovely, extremely child friendly resort. Would definitely recommend. Truly a 5 star holiday. Baby sitting was not as good as Hilton. The pool facilities were better for children and also the use of the fantastic beach. However we found the food for the children not very good. The Hilton had far superior kids meals - the amount and the quality! There were activities organised by the hotel that we participated in which was great and fishing charters available from the hotel which was a big win for my husband! Sometimes the staff needed to be asked more than once to get things done but the room and the resort were great! I have been at a few resorts and I am extremely happy I chose The Intercontinental Resort , the service the people the views the activities just amazing cant wait to go back.